Let All Pest Exterminator Richmond drive these destroyers away from your house. Moles are small mammals that are known mostly in two types: the eastern mole and the star-nosed mole. They look alike; however, the eastern mole has a naked red nose and a short tail. The star-nosed mole has a long tail and a large red nose with finger-like projections. Moles belong to the same family as shrews and desmans: the Talpidae family. Other types of moles are the broad-footed mole, hairy-tailed mole, coast mole, shrew mole and Townsend’s mole. 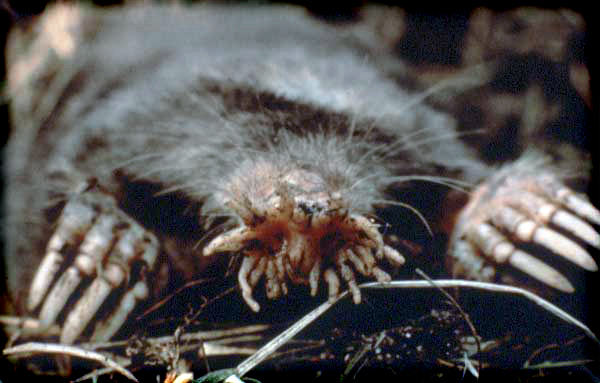 The mole’s tail acts as an organ of touch. It helps the mole move backward in his tunnels. Moles have short front feet and prominent toenails. Palms facing outward enable them to get through the soil in the same manner a man swims underwater. The head of the mole is elongated, the neck is very short, and external ears are missing. Nevertheless, moles have a very keen sense of hearing. The pig-like snout with tiny eyes and velvety slate-gray fur make moles recognizable. Their fur keeps out dirt and water, which is helpful when moles move underground. It is an interesting fact that moles have approximately twice as much blood and red hemoglobin as other mammals of such a small size. This advantage makes it relatively easy for a mole to breathe in its natural underground environment where the level of oxygen is low and the level of carbon dioxide is high. Moles remain mysterious creatures simply because they are rarely seen by humans. What is often seen and disapproved of though, is the result of the moles activities: molehills and up-heaved ridges of their tunnel systems. Moles normally make burrows in high dry spots. However, cool and moist soil rich in grubs and worms makes up the best environment for the mole’s hunting. Moles can be found in natural woodlands, grasslands, neglected orchards, parks and lawns, and sometimes even under portions of buildings. Moles construct underground passageways and permanent tunnels for winter use. Call Richmond Indiana Exterminator for an effective mole bait called Talpirid.